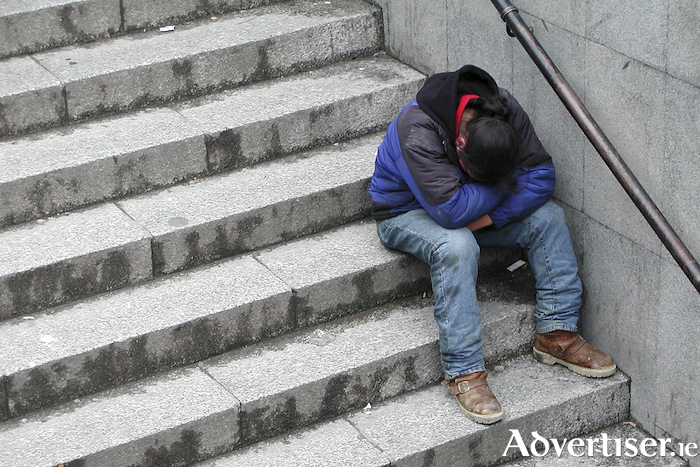 Homelessness in Galway city is the worst in 20 years, according to assistant CEO of Cope Galway, Martin O'Connor, his comments come in the wake of this week's death of young man in the grounds of City Hall. The man, who has been named as Martin Carroll (29 ), was pronounced dead at the scene and his body was removed to University College Hospital shortly after noon for a postmortem. The postmortem ruled out any suspicious circumstances relating to the death. He was known to the gardaí, was from the city, had returned to Galway late last week, and had engaged with housing services over the weekend. COPE Galway is understood to have described Mr Carroll as a "nice young lad who had gone astray". Mr O'Connor, who has been working with the homeless for two decades, says the discovery of Mr Carroll once again highlights the problem of homelessness and the chronic shortage of social housing in the city. "Although it is unconfirmed whether the man was homeless or not, this only highlights the problem of homelessness in Galway city. The situation is just unrelenting. We are seeing new presentations of people becoming or about to become homeless on a daily basis. On Monday night we had 13 presenting themselves at our day centre on the Seamus Quirke Road. As a consequence of the increase in the presentations, the numbers in emergency accommodation continue to grow. "The homelessness situation is the worst I have seen in my 20 years working in the sector. With the cold weather about to hit us now in November, there is always a concern for those sleeping rough as they may come into harm. Cope Galway in conjunction with the Galway City Council will have 21 extra beds in place by the end of November at our day centre. This is the third year we have had additional beds [at the day centre] over the winter period." Mr O'Connor also says it is likely that the figures of homeless people in the city is higher than the official statistics because the figures do not include rough sleepers or those who are coach surfing at family and friends' properties. "The manner in which homelessness is counted has always been a contentious issue, with the figures only including families and individuals living in emergency accommodation and whose details are on the Pathway Accommodation and Support System. These official figures do not include people sleeping rough or the growing number of families without a home of their own who are bunking in with relatives and friends. It is unknown how many more there are locally and nationally who do not have a home of their own and who are dependent on the generosity and understanding of others, and these are ignored when it comes to the official figures." Mr O'Connor says COPE Galway is already planning six months in advance in terms of providing emergency accommodation due to the overreliance on the private sector. "For three plus years, there has been a huge reliance on private emergency accommodation such as hotels and B&Bs. We have to plan six months ahead because summer sees a major influx of tourists into Galway resulting in a lack of beds in these establishments, so we are doing our best to source accommodation for those who need it when the tourist season begins. "Homelessness is a long term problem in Galway and will only be eventually solved by the building of additional social housing and we need to be working towards a long term solution. However, we are working on short-term solutions as well as we do not know when more social housing will be built. Cope Galway is committed to working with the Galway City Council and the HSE to make sure that no one has to sleep rough in Galway city. However, without more housing coming on stream, particularly social housing units, we fear that the situation will continue to deteriorate." The Galway City Council extended its sympathy to the family and friends of the deceased, while the Mayor of Galway, Labour city councillor, Niall McNelis, said he was "shocked and saddened" by the death. He has asked the Minister for Housing Eoghan Murphy to visit the city as winter looms and the homeless problem intensifies. Mayor McNeilis said; "I have invited Minister Murphy to visit Galway. It must be stressed that it is unconfirmed that the young man was homeless or not, but with the cold weather approaching in November, it must be restated that Galway does have rough sleepers and that homelessness is a big problem in Galway, not just in Dublin." Mayor McNeilis described the current housing situation in the city as "heartbreaking" as people struggle to find accommodation and the number of Airbnb type properties is increasing the problem. "There are 19 Airbnb like platforms that are operating within the city of Galway at present. These properties are short-term leases meaning tenants are struggling to find long term accommodation, therefore increasing the pressure on the demand for houses. Galway is a city which has a huge population of students and young workers and has a massive influx of tourists during the summer which creates the perfect situation for rent hikes. It really just is heartbreaking." The death of Martin Carroll on the grounds of City Hall, the second death of a homeless person in Galway in the space of 10 months, was "not inevitable", but is the "direct consequence of the housing crisis" which is the result of the policies "pursued by this Government". This is the hard-hitting view of Independent Galway West TD Catherine Connolly, who was reacting to the discovery of the body of man, found in the bushes outside City Hall on Monday. According to Dep Connolly, Mr Carroll's death brings to 25 the number of homeless people who have died nationally in just over 15 months. She called this "a stark indictment of Government policy". There is a growing view that the Government's 'the market will provide' approach to solving the State's housing and accommodation crisis has failed, and that the Government must intervene directly through the creation of social and affordable housing construction programmes. Dep Connolly has been arguing for such an approach since her election to the Dáíl in 2016. Dep Connolly says the housing crisis will remain unsolved, and "inevitably there will be more deaths", as long as 'the market will provide' approach remains, and she has also called on Minister Murphy to visit Galway and examine the situation for himself. However, as Dep Connolly points out, the Fine Gael led Government, "rather than embrace that solution", has instead, "with initiative after initiative", directly supported the private market. This year the housing assistance payment doubled to €300 million and will rise to €421 million next year as a result of the recent Budget. According to the Galway West TD, this money "is going directly into landlords' pockets with absolutely no security of tenure for the tenant". The TD also says a commitment by both the Galway city and county councils, to build public housing on public lands, is required "as a matter of urgency". She says there is "no shortage of land in Galway", but that there was "an official failure to recognise the extent of the crisis", and that public housing on public land is "an essential part of the solution". "We must have an urgent meeting with the local authorities with a view to rolling out an urgent housing construction plan and confirmation that Airbnb will be immediately regulated," she says. "In addition, the Government has to introduce immediate measures to deal with Airbnb which has significantly reduced the number of properties available to rent in Galway."